Buffs away dry, excess skin • Sooths and illuminates body contours • Nourishes and hydrates skin with vitamins and antioxidants to brighten and revitalise. Apply directly onto dry skin over the entire body and massage in a circular upward motion, paying particular attention to elbows, knees and heels • Rinse thoroughly and dry • Repeat 2/3 times weekly. Follow exfoliation with SOIE FLUIDE silky body lotion or or one of deW’s 100% botanical body oils to hydrate and condition the skin • Use prior to self-tanning application • Excellent for use in manicures and pedicures. 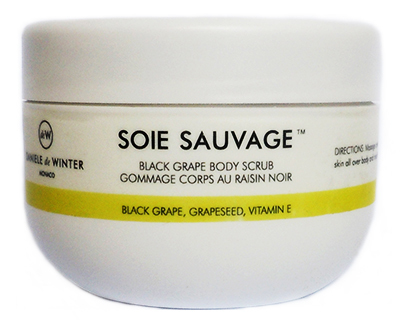 Fragrant, botanical and paraben-free; leaves skin silky smooth.